Sorry... the 2017 Volkswagen Golf Alltrack is no longer being sold as new. Instead, take the first step to a great deal on 2019 Volkswagen Golf Alltrack with a free price quote! The 2017 Volkswagen Golf Alltrack is an all-new, high-performance version of the Golf SportWagen. It competes with the Subaru Outback in vehicle segment that blurs the line between wagons and crossovers. Three trims are available: the S, SE, and SEL. 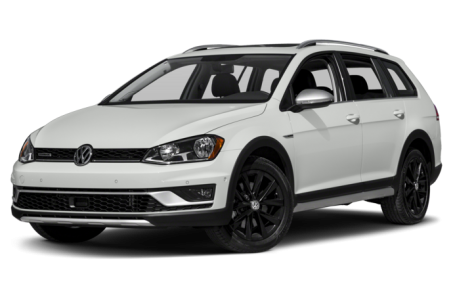 The Golf Alltrack has more rugged, aggressive styling than the Golf SportWagen. It also has more ground clearance for off-road driving. It features a black-clad underbody trim, a grille and a fascia with a black honeycomb-mesh pattern, smoked headlights, and side rails. Standard features include front fog lights, daytime running lights, power/heated side mirrors with turn-signal indicators, and 17-inch alloy wheels. Available features include Bi-Xenon headlights, LED headlights, and larger 18-inch alloy wheels. Under the hood, the Golf Alltrack is powered by a standard 170-hp, turbocharged 1.8-liter 4-cylinder engine mated to a 6-speed dual-clutch automatic or manual transmission and 4Motion all-wheel drive. It produces 199 pounds-feet of torque. The available Drive Mode Select includes an Off-Road Mode for optimized traction control. Fuel economy for the Golf Alltrack is an EPA-estimated 22/30 mpg city/highway. Inside, the Golf Alltrack has a premium leatherette interior with a 60/40 split-folding rear seat. Cargo capacity is 66.5 cubic feet with the rear seat folded down. The center stack features the MIB II infotainment system that includes a 6.5-inch touchscreen, Apple CarPlay/Android Auto compatibility, Bluetooth connectivity for phone and audio, an SD card slot, and a USB port. It can be upgraded with an integrated navigation system, a Fender premium audio system, and Car-Net connected services for vehicle settings, diagnostics, emergency calls, and stolen vehicle location (subscription required). Power/heated front seats and power windows/locks come standard. Dual-zone automatic climate control, remote keyless entry, push-button start, a 115V outlet in the cargo area, ambient lighting, and a panoramic moonroof are available as well. The Golf Alltrack was named a Top Safety Pick by the Insurance Institute for Highway Safety (IIHS). It also earned a full 5-star overall crash test safety rating from the National Highway Traffic Safety Administration (NHTSA). Standard safety features include a backup camera and a post-collision braking system that prevents secondary collisions. Available active safety features include adaptive cruise control, forward collision warning, autonomous emergency braking, lane departure warning, and park assist. 25 of 26 (96%) consumers said they would recommend this vehicle to a friend.